We’ve all been to one: the terrible themed party. Mine was a backyard Hawaiian surprise party, complete with fake lei necklaces and the hostess dressed in a grass skirt, completed with a coconut bra. Let’s just say it was overkill, especially with the mostly 60+ crowd. No one was having fun, because aside from the awkward decorations and costumes, it wasn’t a Hawaiian party. There was no music, no atmosphere, nothing. It was weird. And thanks to these tips, your themed party will be anything but weird. Themed parties can seem easy, but it’s not all about a few strategically placed tropical flower decals, silly costumes and some Hawaiian Punch in a bowl. Here’s a strategic guide to throwing the best themed party your friends have ever known. 1. Pick something you love. If you don’t like 80s music, John Hughes movies or neon, don’t throw an 80s-themed party. Hate Hawaiian prints and cheesy leis? Don’t throw a Hawaiian party. Go with a theme you’re comfortable with and one that can also be easily defined. If no one knows what a Kardashian-themed party would look like, it’s going to be a little awkward. (Of course, if you and your friends are creative, up to the challenge and love the Kardashians, go for it!) When you’re comfortable, you have more fun and enjoy yourself. Pick something you won’t be worried about everyone “getting.” And if you’re really stuck for an idea, here are some to get you going: Party Theme Ideas. 2. Be sensible. You can’t throw a Hawaiian party in January. It’s just not logical. You can throw a “Hell Has Frozen Over” party, which would be pretty fun, with the ice and fire aspect. Work with what you have, and also work with your circumstances. If it’s a surprise birthday party, use a theme the guest of honor likes the most. Remember, you have a lot more wiggle room when it’s just a party for the sake of partying (which is a reason in and of itself to party, if you ask me). 3. Commitment. I’ll just say it: life is better when you commit. Stick to your theme and go down with that ship. Throwing a luau? Go big or go home; a few sticky flower decals and punch won’t cut it. Dress up in a hula skirt and coconut bra, put on Hawaiian music, try looking up authentic (or just cheesy) Hawaiian dishes. Ask your friends to play along, too, with accents for a British party (only for the brave) and outfits. You can’t be embarrassed by the theme you picked; that’s very important. If you are, no one will have any fun. The theme isn’t there as an awkward detail of the party … it’s the main reason for the party! Get creative! 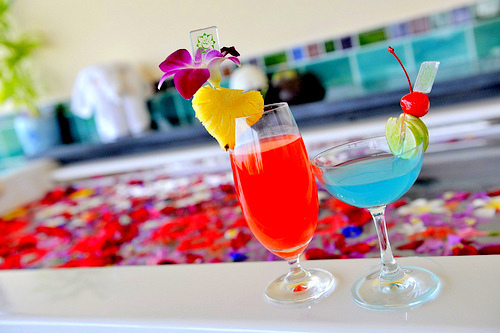 Don’t forget that the little details count, like umbrellas in tropical drinks. Although there’s no need to stress over them, try to remember it’s often the little things people remember, not the big things. Hint: Partycity.com has some really fantastic stuff for all kinds of themes, so it’s a good place to start looking for ideas! 4. Recruit dedicated friends. If you know a friend has this insane talent, whether it’s a great band that does 80s heavy-metal cover songs or 50s tap-dancing skills, ask them to be the center of attention for a while at the party. Friends and attendees who are enthusiastic about the theme are more likely to get other, not-so-confident people out onto the dance floor or chatting with people. 5. Party games? This is completely optional, because they can be fantastic or a complete bust. The most important point here is to get creative (and stick to your guns). Make sure you know the vibe of your crowd. If you think they might be up for a little 1950s swing-dancing lesson and then attempt to try it out, go for it. If you know they’d rather just mingle and dance to some 90s alt-rock all night, let that happen. You don’t want to shove people out of their comfort zone; you just want to make sure they have a great time (and you should, too). The most important tip of all? It sounds cheesy, but have fun! As the host or hostess, if you’re not having fun, your guests won’t either, no matter how creative your theme is. Go have fun and embrace your theme for the night. Be a crazy Kardashian, a 1980s rock star or a glamorous Golden Globes awards siren (I’ve always wanted to throw an Academy Awards-themed party! Do it for me?). Party like it’s 1999, let your hair down, and have fun. You can worry about cleaning up all of the fake Hawaiian grass skirts and little tropical drink umbrellas tomorrow.